A Donald Ross Classic Challenge. 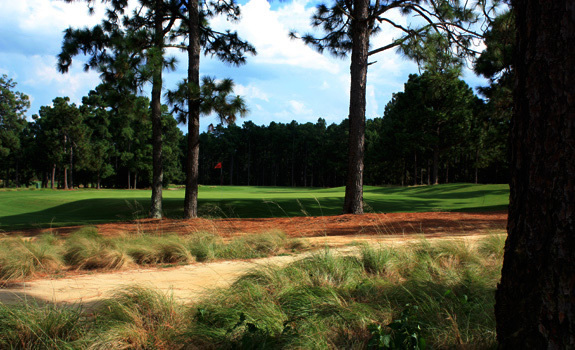 The Sandhills of North Carolina are filled with a wide variety of outstanding golf experiences. 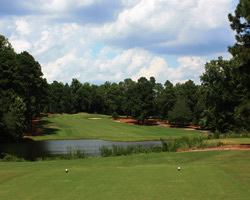 One of the favorites for generations continues to be the Pine Needles and Mid-Pines Resorts. 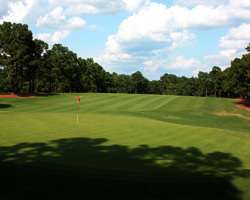 Pine Needles continues to be mentioned with some of the best layouts in the land after hosting the US Women’s Open on three occasions. This Donald Ross beauty seamlessly rolls over the landscape challenging the golfer to hit a variety of shots. The layout presents numerous challenging holes, many requiring the player to shape drives and approaches to the correct spot. Ross created a routing with strong dogleg holes, so let’s have a look at the “Lefts and Rights” of Pine Needles. The first hole, a medium length, uphill Par 5 doglegs to the right with a trap protecting the inside corner and a severe fall off guards the right side of the green. Number 14 again plays as a dogleg right, climbing slightly uphill with a large bunker guarding the front right. The final two holes are sharp dogleg left holes, with Hole 17 needing a sharp right to left tee shot to avoid the bunker and right rough on your way to the raised green. The finish hole is a gentle dogleg with a considerable downhill. Your downhill lie on the approach must be pure as the well bunkered green funnels less than perfect shots into a nasty pot bunker left.